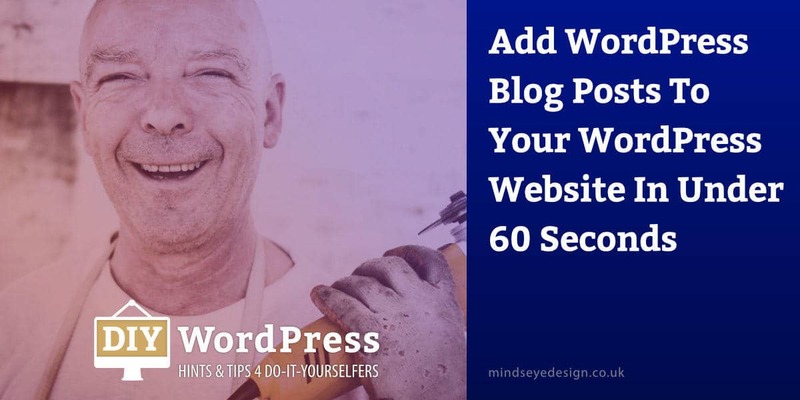 Adding WordPress blog posts in under 60 seconds isn’t the main aim of this blog post, what we are trying to show you is how quick and easy it is to create and publish a new blog post from start to finish. It really is very simple and we’ve outlined the six steps below. Presuming you have already logged into your WordPress admin area, you first need to hover over the Posts module link in the Sidebar of your Dashboard and select ‘Add New’ from the fly-out menu. The Add New screen will then appear, with lots of options for creating and styling your new WordPress blog post. We will discuss styling options in more detail in a future post. For now, let’s just concentrate on creating and publishing your post. Once the Add New post screen has opened, there are six things to do before you Publish your blog post. Add your post’s content to the Editor. Add your post to a Category. Add some Tags to your post. Set your post’s Featured Image. Publish or save your blog post as a Draft. Write your post’s title in the box at the top of the page. Keep it between 50 and 60 characters in length. Here’s some information about titles, but basically, it’s because the search engines often display your title in the Search Engine Results Pages (SERPS). To add content to your WordPress blog post, click your mouse in the Visual Editor area and type or paste in your content. You can also style your text in the visual editor, add bulleted or numbered lists, add images, videos and even audio tracks. If you’re pasting text from Microsoft Word, be sure to use the ‘Paste as text’ icon in the second row of your Visual Editor toolbar icons. This will help avoid any styling conflicts that might be imported with your content from Word. TIP: If your WordPress theme supports post formatting, you can choose from the Format module to the right of the Editor. This determines how your website will display your post, for example, the default Standard blog post has a title and paragraphs, but if you just want to post a ‘Thought of the Day’ a short Aside post omits the title and only contains a brief excerpt, and if you just want to post an inspirational picture an Image post is for displaying a single image. For now, we will concentrate on the Standard post format. Next, assign the post to a category to determine where the new WordPress blog post will be stored and even possibly appear on your website. Putting similar posts in categories makes it easier for readers to find the content they are interested in and therefore good for your users’ experience. Choose a category from the selection box in the right-hand column next to the Visual Editor. If the category you want does not exist, you can create a new category within the Categories box and add your blog post to it. Assigning Tags (words related to your post) are another way of grouping similar posts and making it easier for readers to find posts on your website with the same type of content. Tags are completely optional but can increase the visibility of your posts. You can read more about Categories and Tags in this blog post over at ManageWP. To set a featured image, click on the Set Featured Image link in the Featured Image box to the right of the Visual Editor. This will open the Media Library window from where you can select a featured image or upload a new image from your computer. Tip: A featured image is used to visually represent the content of your blog post. Many WordPress themes use featured images to enhance the look of your site so it’s good to add one when you create a new post. They are also a great way to capture your viewers’ attention and encourage them to click on a blog post to read it. Now you’ve done all the hard work, you can either save the post as a Draft or click the Publish button. We recommend saving your new blog post as a Draft first so that you can preview it and check the content is styled and laid out as you want it to be. Saving as a Draft is also useful if you want to finish a post later or collaborate with a colleague on the content. If you have saved the post as a Draft, you can click the Preview button in the Publish module to see how your post will appear on your blog to other readers. When you’re happy with how your post appears, click on the blue Publish button to save your changes and publish your blog post to your website. Why don’t I just add my content to a page on my website? Pages and Posts are quite different and they’re used in quite different ways too. Very basically, Pages are static whereas Posts are entries listed in reverse chronological order on the blog home page. Posts can be tagged and categorised, making it easier for readers to find the content they want to read, and for you to help them find it, especially as posts get older they get archived by month and year. Tip: For more information, read the WordPress support article ‘Post vs. Page’.